Getting engaged is considered to be one of the biggest events of a woman’s life, next to the actual wedding of course. However, getting engaged doesn’t have to break the bank. There are a wide variety of options when considering an engagement ring, including buying a used ring. While some people are a little wary of buying a used engagement ring, it is a good option to consider, especially if you are shopping on a budget. The vows may endure until death does you part, but the ring payments shouldn’t. The price of a used engagement ring can vary as widely as buying a new one. Most of the factors you would consider when buying a new ring are still the same factors to consider when buying a used ring. Prices will vary depending on the style, color, and cut of the stone. The unique factor that will affect the price of a used ring is that generally the seller will be trying to get some of the money back that was originally spent. This can occur for various reasons such as a broken engagement or they simply want to upgrade the ring and are trying to get some money out of the old one to do so. 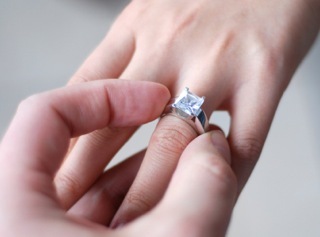 Since the reason for selling an engagement ring varies, the price set by the seller will too. A general guideline given for how much to spend on a ring is two months salary. The advantage to buying a used ring is that the same two months salary can potentially buy a nicer ring with a larger stone. For those who just can not get comfortable with buying a ring they can not actually touch, there are some different options. Pawn shops often take in rings from those that need quick money. You will be able to touch and examine the ring, but be sure to ask about getting it valued before purchase being final. Like a jewelry store, a pawn shop has other costs and will price the ring so that they are making a profit. While still less expensive than a jewelry store, you can probably get a better deal by looking in the classified ad section of the newspaper. You can also mix online and traditional shopping by using the online version of your local newspapers classified ads. After finding ads that hold your interest, you can then contact the seller and make arrangements to see the ring. Again, you will want to be sure to work out how to have the ring valued before making a purchase final. The disadvantage of buying traditionally is payment method. With the possible exception of pawn shops, you will need to be able to pay for the entire ring at once. Most, if not all, individuals advertising in a classified ad are not going to be willing to take multiple payments from someone they have never met before nor will they have the ability to accept credit cards as payment. Buying a used ring is a cost effective way to get engaged, but driving to multiple locations to see the rings can be time consuming. Shopping online can be very convenient. Shopping online is extremely popular for any item, engagement rings included. The web is full of places to get a good deal on an engagement ring. Shopping online can also turn up the best deals. Even with its convenience, online shopping still has both advantages and disadvantages just like anywhere else. Auction style listings are widely available. Websites such as eBay.com or idonowidont.com give you a chance to bid on the ring of your choice. This gives you the opportunity to get an even better deal. The websites mentioned above also have measures to guarantee your purchase. Save time. You can spend two hours looking at a wide variety of options online. The same two hours would probably only give you time to look at two or three traditional stores. Most major newspapers have an online version of their classified section. You can type in a few specific keywords and get only the listings you want. This is a huge time saving advantage over searching through the actual newspaper one ad at a time. Online shopping puts price comparisons at your fingertips. Many websites offer comparison options where you can look at multiple rings side by side on your screen. You can also just move from one site to another and compare as you go. Save any options you are seriously considering, and go back for a more thorough look. Not being able to actually “see” the ring can be uncomfortable for some. For an expensive item like an engagement ring, it can be a little unnerving to buy something you can not see and evaluate first. You have to assume that the pictures and information provided are accurate. You also have to wait until after the ring is purchased and delivered before you can take it to an expert to have it evaluated. However, as mentioned, reputable websites such as eBay have procedures in place to keep you from getting ripped off. Beware inaccurate advertising to bring interest. There are a large amount of good deals on the internet. Some deals seem too good to be true. In most cases, they are. When shopping online, be extremely wary of any deals that are extremely cheaper than others you find. Usually, if a price is that low, they make up the difference in price by charging hidden fees and high shipping costs. Often, these fees are not mentioned until you are already in the final buying process. Also beware of extravagant claims about service and quality that are not backed by money back guarantee. As part of buying a ring, you will need to know what size you are looking for. There is an old wives’ tale that says the size of a woman’s ring will be close to the size of her shoes. This is not founded by fact, and a more exact measuring process should be used. There are many ring sizing charts available online or you can go to a jeweler. Most jewelers will determine your ring size for free. Once you know what size of ring you will need, you can shop more accurately for a used ring. The most cost effective way would be to find a ring that is already the correct size. Size doesn’t have to limit your shopping since rings can be resized. Most jewelers will resize a ring, even if they didn’t sell it to you. They do charge for this service however. The cost of the resizing will depend on how much work it is. Getting a ring changed from a size seven to a size twelve will be more expensive than getting a ring changed from a size seven to a size eight. If you find a used ring you like, but it is the incorrect size, be sure to research the resizing cost and figure that into the ring budget. Comparison is the key to getting the best deal on a used engagement ring. Individuals that are selling their old ring may vary their price based on the emotion they have attached to it. The more attached they are to the ring, they more they think it is worth. However, when buying from an individual seller, you may discover that regardless of emotional attachment, they may be willing to be flexible on the price. This is especially true if they need to sell the ring quickly. This can be an advantage to you if you can talk them into selling for less. Online auctions are a good way to get a good deal because the starting price is generally much less than the worth of the ring. You do have to be vigilant and watch the auction constantly to be sure you don’t lose the ring to a higher bidder. If the bidding goes out of your price range or the value you think it has, stop bidding. Don’t let the competitive nature of online bidding get to you and cause you to spend more simply to win the auction. Do some research and learn what to look for in a ring. Some jewelers offer classes (be sure they don’t require a purchase to attend), and there is a wealth of information online. Just because the seller of the ring tells you the ring is worth a certain dollar amount does not mean the ring is actually is worth what they claim. Finding a way to have the value verified is very important. What Will People Think if I Buy Used? Buying an engagement ring can be an exciting thing, but it doesn’t have to be an expensive one. With a little research and time, you can buy a previously owned engagement ring that will both fit the budget and look brand new. There is often a negative stigma tied to buying “used”. Don’t let that stigma color your view of buying a used ring. Focus on the positive stigma attached to saving money and getting a good deal. In reality, no one would ever have to know you bought a used ring if you didn’t want to tell them. Being a frugal shopper can give you another financial advantage as well: saving all of that money can give you a head start towards your upcoming wedding or a down payment on your future home together.